We Are Nuts! is a seasonal nut company open just three months out of the year. They needed a way to capitalize on sales in that short time frame. Increase online sales 50% from the previous season. 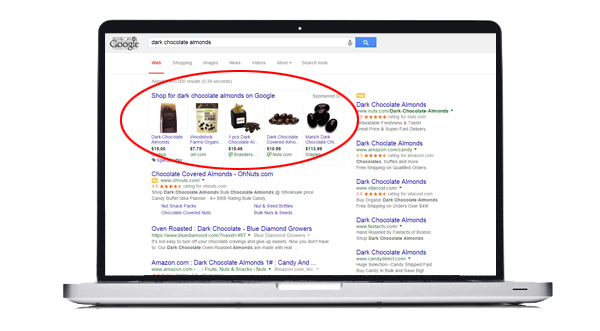 The first was done by implementing a Google Shopping Campaign that made Google Ads out of specific products (like the examples circled above). Google Shopping Campaigns are one type of pay-per-click ad that you can use to market products within Google's search results. We also implemented a feed in the admin area of the website so it was easy for the company to mark which products they wanted to advertise on Google. The second was achieved by improving the user experience, both making products easier to find AND buy. We added a product search, improved the product navigation, turned the main menu into product categories rather than just one menu item for "Shop" and removed an unnecessary step of the checkout process that was delaying order completion. For the third we installed Google Tag Manager and Google Analytics Enhanced Ecommerce tracking on the website which allowed us to create a custom dashboard in Google Analytics for the company to see what they cared about "at a glance": things like daily online revenue, revenue from ads specifically, top performing products and search terms. Goal wildly exceeded! The company saw a 148% increase in online sales over the previous year which included a whopping 151% ROI during their busiest month of the season. "Experimenting" with an SEM campaign worked and the company is excited to do it again, perhaps more aggressively now that they have the machinery in place. Next time they will likely just run the campaign during their busiest month to capitalize further on when ROI was at its peak this year.